Why is Chillwind Yeti a Good Hearthstone Card? When discussing Hearthstone cards, one would be hard pressed not to hear reference to a card's value. A card with good value is a card that gives you a lot of oomph and advantage for the mana invested. In many circles, the Chillwind Yeti stands as a shining beacon of a card with deceptively high value. The value of the Yeti is somewhat deceptive because this heavy hitter lacks any of the bells and whistles commonly found on its competitors such as Charge, Divine Shield, or Deathrattle. 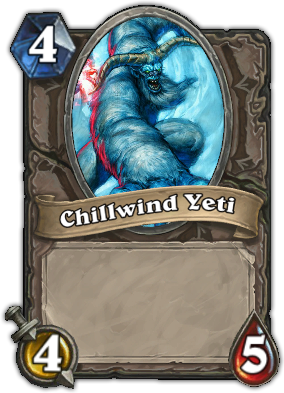 What then makes Chillwind Yeti such a "high value" card and why might it merit a place in your deck? Find out after the bump! Hearthstone actually does a decent job of giving you starter cards that can be worked into a serviceable deck. However, some of the starter cards have next to no place in a competitive deck. 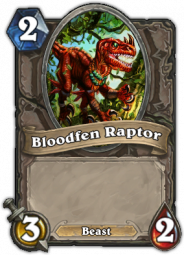 These cards are always ripe for an upgrade and today we will be focusing on one such card: Bloodfen Raptor. One might be forgiven for thinking that this meaty 2 drop has a shelf-life outside of the early game. After all, the Raptor's 3 attack allows him to trade well and his 2 health lets him dodge some wipes and ping attacks. The problem is that there are just substantially better cards available for the same mana cost. So many so, in fact that Bloodfen Raptor has no real place in competitive play outside of very specific Hunter decks. If you are running a Bloodfen Raptor in your Hearthstone deck, it is time to upgrade. Find out how after the bump! So, I haven't been playing World of Warcraft much these days. In fact, I have probably only played Mists of Pandaria for an hour or two total. I still keep up with the game through my favorite Warcraft websites and by following a handful of active players on Twitter. World of Warcraft's lore remains a major draw for me and it is certainly interesting to see how the story underlying the game is developing as we rush headlong toward Warlords of Draenor. However, I just don's play anymore. There are a number of reasons playing World of Warcraft has fallen by the wayside for me. If you are interested, check them out after the break. The good folks over at Blizzard announced yesterday morning that a new pet will be arriving in the World of Warcraft Pet Shop in the near feature. He seems to be a cuddly miniature version of the Winged Guardian mount already available for purchase. In reality, however, the new Guardian Cub pet is nothing more than a stack of gold that you can purchase straight from Blizzard itself. Check out a picture of the pet below and the insidious truth behind those big doe eyes after the bump.